What a difference a roasting makes. Sometimes things that wouldn’t normally appeal transform themselves into the sublime when put through extreme conditions – like diamonds, and people, and bell peppers. Add heat (or pressure) and a rock turns into a brilliant gem, a girl becomes a queen, and a crunchy red bell pepper which I don’t really enjoy turns into a soft, sweet, succulent piece of deliciousness. I say, magic does exist for those who believe! I was never fond of red bell peppers. Call me unsophisticated, but I never properly made friends with its flavour and texture when in its crunchy, semi-raw state. So I lived in ignorance, unaware of the pleasure that waited down capsicum lane after a good roasting. Now I am a convert. Roasted red bell peppers are one of my favourite things. Especially since roasting them is eye-crossingly easy and the rewards are tremendous. When I see those shiny, bright red specimens in the market, a round of roasting is never far away. But even as I line up for every capsicum-roasting opportunity, I still found myself late for this round of Hay Hay It’s Donna Day, where our lovely host Soma of eCurry has chosen Donna’s Chicken & Roasted Capsicum Pasta. Thankfully she has been kind enough to extend the deadline to Monday, March 30…so I, and all of you, still have a chance to join! And I encourage you to do so – especially if it’s warm and busy wherever you are, and making a fresh and simple pasta dish would be very welcome! You can find the original recipe here at eCurry. For my entry, I changed things around a little to suit one of my favourite causes – recycling leftovers and avoiding food waste! 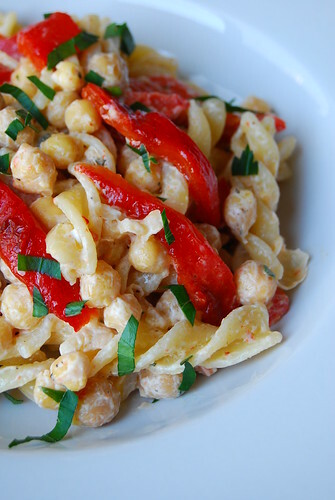 Instead of the roasted red peppers and chicken in the original recipe, I used the leftovers of this Roasted Capsicum and Chickpea Salad which I had made the night before. In keeping with the spirit of this round, I tossed cooked short pasta (I used fusilli) with the leftover salad. The salad itself is a cinch to make – chickpeas and roasted capsicum are tossed with a dressing of lemon juice, olive oil, and garlic (and salt and pepper! ), showered with fresh chopped parsley, and topped with chunks of garlic-infused goat’s cheese. When I find myself with leftovers, I usually chuck everything in the processor and blitz it into a delicious dip. With this round of HHDD upon me though I decided to turn it into a pasta. Just as with the original HHDD recipe, it is a combination of fresh flavours, with the lemony dressing providing the “sauce”. The goat’s cheese tends to melt and blend with the dressing when tossed with the hot pasta, which may be bending the rules a bit, but it was still very light and, as it is on my shores right now, summery. Toss more freshly chopped parsley in before serving! Totally by accident I realized that I also made this vegetarian! So if you are vegetarian, love Donna Hay, and do not want leftovers to go to waste…this one’s for you 🙂 If you believe roasting is a magic spell cast on capsicums to turn them enticing…this is also for you! If it’s summer where you are…this is also for you! If you think we can emerge brilliant and all the better from difficult and taxing situations…this is for you too! *** Hay Hay It’s Donna Day was created by Barbara of Winos and Foodies and is now under the care of Bron of Bron Marshall.